This title was first published in 2002. One of the most fascinating and controversial interpretations of religious diversity is 'religious pluralism.' According to John Hick's model of religious pluralism, all the world's great religions are equally valid ways of understanding and responding to the ultimate spiritual reality. This book offers an exposition of, and critical response to, John Hick's model. Introducing the various interpretations of religious diversity being discussed today, this book presents constructive suggestions as to how things could be further developed to offer a more accurate, less confusing presentation of the various options in theology of religions. The standard threefold typology of responses to religious diversity - exclusivism, inclusivism, and pluralism - are explained and defended. Hick's pluralist interpretation of religious diversity is traced, culminating in a critical assessment of Hick's pluralistic model and an up-to-date summary of a variety of critiques directed toward Hick's proposal. 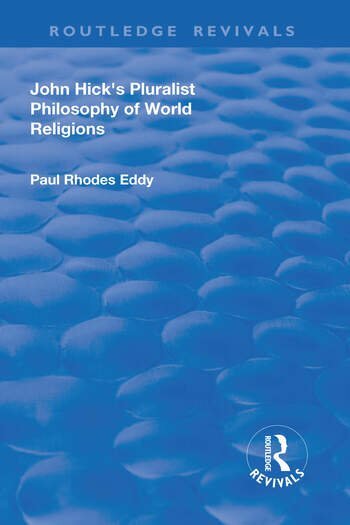 Paul Rhodes Eddy concludes that Hick's present model is ultimately unsuccessful in retaining both of his long-cherished goals, a robust religious realism and a consistent religious pluralism, whilst overcoming the most difficult problem for the pluralist, the fact that the world's religions understand the divine in often contradictory ways. Contents: Preface; Introduction; Christian responses to religious diversity; A pathway to pluralism: John Hick's pre-pluralist thought; The pluralist move: Hick's early model of religious pluralism; The development of Hick's model of religious pluralism; Critical responses to Hick's religious pluralism; 'Does it work?' A critical examination of Hick's pluralist hyphothesis; Conclusion; Bibliography; Index.